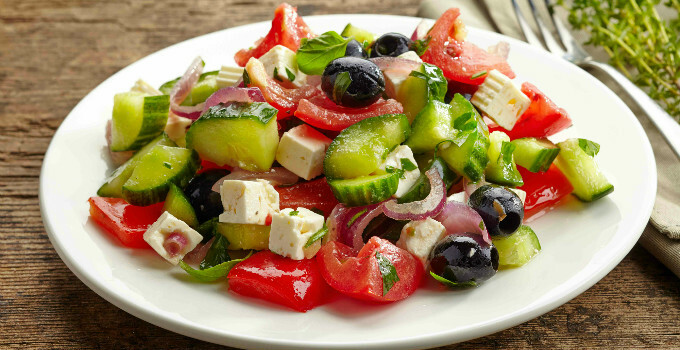 The Greek Salad is my family’s absolute favorite dish in the summer. It’s very refreshing, not to mention healthy. The main secret is to have the freshest ingredients, like all Mediterranean dishes. But I don’t stick to the traditional Greek Salad, I’m quite flexible. So if I happen to have a beautiful head of iceberg or romaine lettuce, by all means they’ll join this delicious salad! I’m giving you some variation tips below the recipe. This wonderful Greek Salad allows you to have fun and make it your own, while still eating healthy! Enjoy! Pour the dressing over the salad, toss well add the feta cheese and olives and serve. If you don’t have or don’t like feta cheese, you may substitute it for sharp cheddar or even brie. If you want to eliminate the dairy, use canned garbanzo (chick peas) or lentils instead of cheese. If you want a richersalad, add 1 seeded and sliced bell pepper (capsicum) green, red or yellow. You may eliminate the pita bread from the recipe if you are on a gluten-free diet.